At the close of the fourth century AD, Rome faced its greatest danger in over 500 years. To the east, the Sassanid Persian Empire presented a powerful challenge to Roman dominance in the Middle East. To the north, German tribes pressed against the Rhine frontier. To the northeast, Gothic tribes also stirred. And rival Roman would-be emperors faced off against one another. 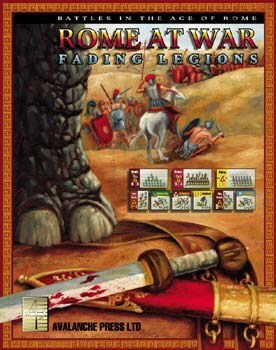 Fading Legions covers these battles, when the last of Rome’s legions faced hordes of enemy horsemen. The Romans are in a state of military transition, adding more and more mounted and missile-armed troops to their forces while retaining the heavy infantry that had formed the army’s backbone for centuries. Despite Rome’s undoubted cultural and scientific superiority, the empire’s enemies have a decided edge in military technology. The Persians, who face the Romans in five of the game’s scenarios, have war elephants, but their real advantage comes from their “cataphract” cavalry: big men on big horses, both protected by chainmail armor. The Persians usually have large numbers of infantry, but these aren’t very good. Barbarians come in several flavors: Germans, Visigoths and Ostrogoths. Ostrogoths (known as Greuthungi at this phase of their history) are almost exclusively heavy cavalry, with some allied peoples tagging along as light cavalry and mounted archers. The Visigoths (known as Tervingi in those days) are primarily heavy infantry, with some mounted archers, light cavalry and foot archers in support. And they have their famous wagon-forts to wheel onto the battlefield. The Germans are also most heavy infantry, but bring some heavy cavalry to the battlefield as well. Rome’s striking power is in her legions, disciplined heavy infantry, but these are vulnerable to arrows and heavy horse. There’s a whole legion capable of missile fire, plus some auxiliary light infantry and light cavalry capable of loosing arrows. Rome has but a handful of armored cavalry, and only one of these units is as good as their Persian counterparts. But they do have one unit of camel-mounted archers. There are 11 scenarios included in Fading Legions.